Here’s a portion of the EXCLUSIVE interview between Seventeen Magazine and our dear Jacqueline Emerson who plays Foxface in The Hunger Games. Unfortunately, due to copyrights, it is illegal to post the whole interview here. So, simply head over to Seventeen.com for the rest of the interview! Remember to follow us on Twitter at @HungerGamesSG and Like us on Facebook here! The Hunger Games featured in March 2012 Teen Vogue!! Hear what the ladies of The Hunger Games have to say in the latest edition of Teen Vogue, and what hunger games merchandise PEOPLE ARE TALKING ABOUT! Aaaaannnnnddd… close ups of Rue and Glimmer’s interview dresses! 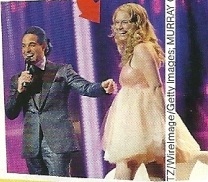 These scans are courtesy of HungerGamesDWTC. [HOT NEWS] “Safe & Sound” – Hunger Games Official Soundtrack Single! The first single off The Hunger Games Official Soundtrack has been released! Isn’t this exciting? Just a few moments ago, Taylor Swift revealed that her song, Safe And Sound, which is a collaboration with The Civil Wars will be in The Hunger Games Soundtrack. WHAT ARE YOU WAITING FOR?!?! Buy the song here! OR you can listen to it HERE!! And here are the lyrics, courtesy of hungergamesdwtc. So, what do you think of Safe & Sound? Some love it, some hate it. Tell us what you think or how you feel on Twitter at @HungerGamesSG or, on Facebook at TheHungerGamesSG. Or simply below by commenting!